Are YOU, dear reader, living in an area ravaged by man-made quakes due to oil fracking? 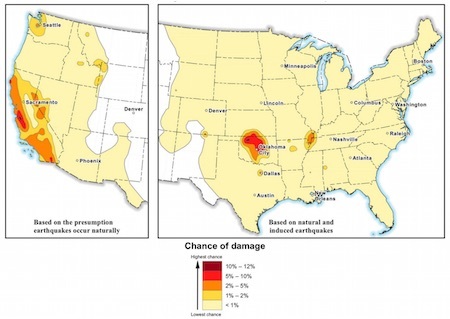 Check out this map by U.S. Geological Survey scientists comparing natural quake zones versus man-made quake zones. The big difference is, the quakes in Oklahoma and Texas are "induced" — they're caused by oil and gas operations that pump wastewater down into underground wells. USGS scientists have now published the first maps of these new quake zones, and they're an eye-opener. An eye-opener because 7 million people are now, suddenly, living in quake zones. There are 21 hot spots where the quakes are concentrated. They're in places where, historically, noticeable earthquakes were rare. 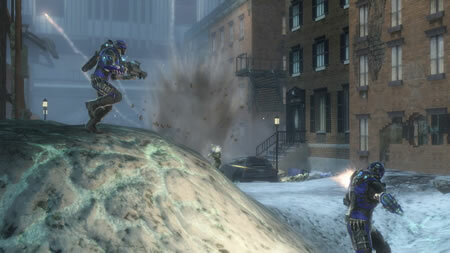 Sooner or later, American citizens will start playing the game Fracture, and start to wonder if weaponry like Tectonic Grenades that create "terrain deformation" might not be feasible after all.